"The Madison Building is taking on water," said Architect of the Capitol's (AOC) Historic Preservation Officer Mary Oehrlein. And the Madison Building isn't alone. Viewed from a distance, the buildings of Capitol Hill are inspiring and impressive, but as with an impressionist painting, it's best to focus on the subject and not on the details. Up close, the buildings are more depressing than impressing, as weather, age and deferred maintenance are destroying many of the finer details of these awe-inspiring stone edifices. Stone preservation across Capitol Hill is a top priority for the Architect of the Capitol as nearly every building is enveloped in stone and all have problems. To address this stone pandemic across the Capitol campus takes a team of historic preservationists, structural engineers and stonemasons, among others. The men and women of AOC are in a race against time as the infrastructure rapidly crumbles and deferred maintenance projects accumulate. Meanwhile, the potential loss of historic artwork and architectural features and significant safety threats from falling stone are compounded. Instances of cracking and spalling stone grow more serious and more costly to repair. The temporary fixes that the AOC undertakes to prevent catastrophic failures are not enough to prevent conditions from worsening. Stone crumbling on the Cannon Building. This was evident in October 2013 when a large piece of stone broke away from the Cannon House Office Building and fell several stories to the ground. Fortunately, it was in an area where there is no pedestrian traffic. The piece was large enough that if it had fallen in a public area, it would have caused great damage to anything or anyone below it. To get a complete picture of the problem, Oehrlein and AOC Architect Marty Shore have been conducting a series of exterior stone surveys. The results of these condition assessments confirm that the exterior stone on most, if not all, of the buildings on Capitol Hill are rapidly deteriorating including those of Congress, the Supreme Court, the Library of Congress and the U.S. Botanic Garden. "There is a long history of surveying the conditions, but not repairing," said Oehrlein. "In 1960, a lighting strike to the southwest corner of the Capitol knocked a large piece of the cornice off. As a result of this, Owen Ramsburg, an AOC employee, did a survey of the whole building, and without exception, the damage he documented is still there." Owen Ramsburg, in 1960, surveys stone damage at the Capitol. Photo from AOC archives. In fact, Owen Ramsburg served as general engineer for the AOC from 1959 until his retirement in 1978. In his retirement letter to Architect of the Capitol George Stewart he said, "For me it has been a time of most interesting work in a most interesting building, and I assure you I shall continue to have a sincere concern for it." Shore adds, "The good news is that there are a number of assessments underway, and they lead to projects to make the necessary repairs." To make the necessary repairs, a number of methods are used, starting with the least invasive, gentlest materials and methods possible to clean the stone. For example, high-pressure power washing is destructive to stone, as it removes top layers on the face of the rock and allows water to penetrate further into the stone. Preferred methods include steam, low-pressure warm water, low-pressure micro-abrasion and laser cleaning, alone or in combination with detergents and other cleaning agents. When repairs and replacement are needed, skilled stonemasons are called in. "AOC has some wonderful and talented stonemasons," said Oehrlein. Conferring on restoration plans for the Olmsted Terrace. A project currently being tackled by AOC stonemasons, from both the Construction Division and the Capitol Jurisdiction, is that of the Olmsted Terrace. The terrace surrounding the Capitol's base on the west, north and south was designed by Frederick Law Olmsted and his team of designers between 1874 and 1890, and was completed by 1894. The terrace was designed to provide a strong visible architectural base to the Capitol and heighten the grandeur of the building. It extends approximately 1,600 linear feet and rises about 20 feet in height at its highest point. 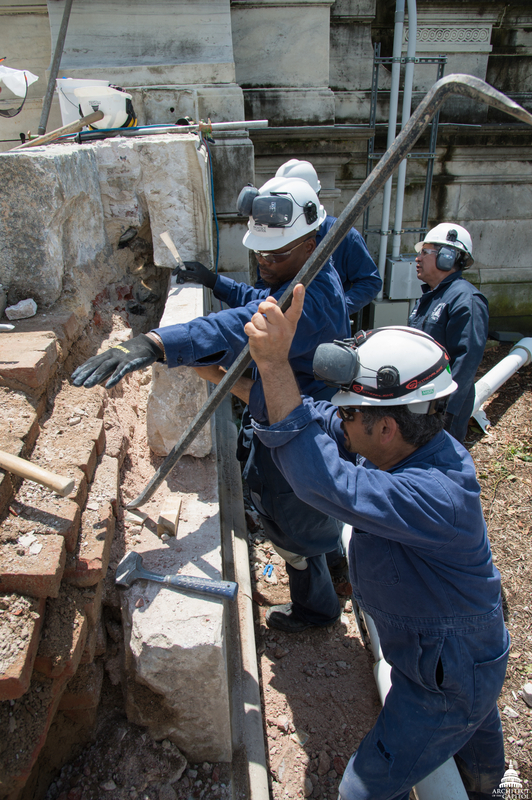 AOC stonemasons remove stone for restoration from the Olmsted Terrace. The walls are constructed largely of Lee, Massachusetts, marble with a granite foundation. The center west portion is constructed of Vermont marble. During the last 120 years, there has been little maintenance performed on the stone and the condition of the terrace has deteriorated over this time. A recent condition survey found that the marble and granite are stained and damaged, requiring a number of different types of maintenance and repairs. To restore the Olmsted Terrace, the AOC is starting a five-phase project that will clean and repair the terrace walls. Repairs include dismantling and rebuilding some of the walls, repointing, patching holes, Dutchman repairs (using a wedge or small piece to conceal a flaw in construction), cleaning the stone, and trimming and removing trees and bushes along the terrace walls. The project is planned to occur between spring and early winter for the next five years. Work has begun on the first phase that includes the northeast approach walls, stairs and eastern portion of the north terrace wall. 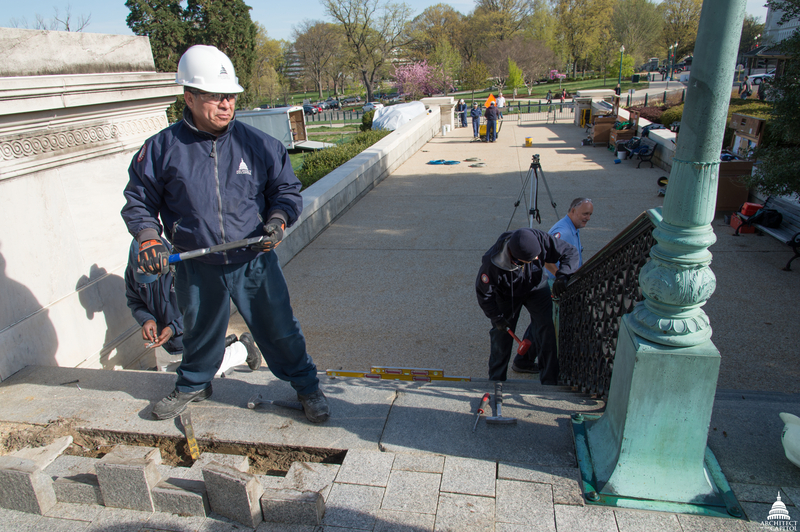 Removing stairs to be repaired near the Senate entrance of the Capitol. AOC stonemasons may be making repairs in the 21st century, but the stones they are lifting were quarried and set in place more than 100 years ago (the stone itself is several million years old) and the techniques they use are thousands of years old. Stonemasonry was one of the earliest trades in the history of civilization, from the pyramids of Egypt to the buildings of the Roman Empire. One technique developed by the Romans was the "lewis," a system used to lift stones that that cannot be otherwise lifted or placed with straps or other devices. The system works by inserting a lewis pin or bolt into holes drilled in stone, the pin or bolt is then connected to a crane or block and tackle to hoist the stones out of, or into, place. Today's AOC stonemasons are using the lewis holes placed into the Olmsted Terrace stones by their mason brethren nearly 140 years ago, but have the advantage of forklifts and mechanical winches to lift the stones rather than using a block and tackle and brute strength. "I enjoy the job. It is important to us — we feel we are part of history and we know where we are working," said AOC Construction Division Stonemason Juan Sandoval, standing amidst the granite and marble stones he is repairing at the foot of the Senate side of the Capitol. Beyond the work on the Olmsted Terrace, scaffolding will soon cover many buildings across the campus in support of critical stone repairs. These include planned work on the first phases of the Capitol Building and Russell Senate Office Building, the Cannon Building Renewal and the U.S. Botanic Garden Conservatory. As Architect of the Capitol Stephen T. Ayers recently testified to the United States Senate Committee on Appropriations, Subcommittee on the Legislative Branch: "There is much work to be done, but we believe that preserving the historic fabric of our nation is well worth the effort." I am un engineer living in Argentine. I enjoy reading this kind of articles. It is interesting seeing how you take care of the building. I will be visiting The Capitol in September to enjoy it much more.